"Hey, Kids! Give a hoot! Help out your old pal Krusty the Clown! 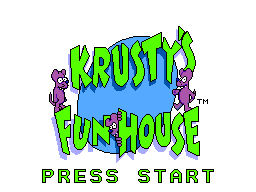 My official Krusty's Fun House is infested with rats! I've got my loyal cadet Bart Simpson to guard the rat traps, but I need you to lead those filthy rodents into those traps! Then we blow'em up! We laser-blast 'em! We KRUSTERISE the little stinkers! Hoo boy! 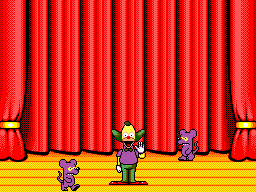 Making Krusty's Fun House vermin-free is not a pretty task, kiddy cadets - but someone's gotta' do it!" 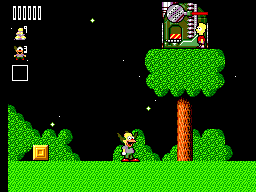 Though there is no code possible to reach the very last level persay, you can access the main stage that will then enable you to try the final levels. At the title screen input "ELFMAN" as the code and you can now enter the final door. Level maps (by Maxim) in .ZIP format. 942kb in size.